Nicolas-Joseph Cugnot is recognised as building the first self-propelled vehicle to transport man. Cugnot was at the time an engineer in the French Army. Steam power has been used since the early 1700’s for fixed machines that pumped water from mines, or raised heavy equipment. It was not known at the time how to convert the back and forth pass motion of steam power into a rotary movement to make a wheel turn. Cugnot solved this problem and in 1769 built a full size prototype vehicle based on a model he had made some six years earlier. 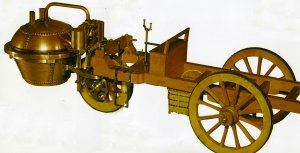 His Steam Dray (fardier a vapeur) had 3-wheels with iron rims, two wheels were at the back with the one wheel in front. Cugnot’s Steam Dray was designed initially as a “gun carriage” to transport large pieces of artillery and was tested to carry large loads. In July 1771, Cugnot had built a second vehicle ready for testing. Cugnot had been encouraged in his work by the General Gribeauval and the Duke of Choiseul, who were placed very well at the Court of Louis XV. Gribeauval then wrote to the Marquis de Monteynard, the Minister for the War asking him to close the Avenue of Versailles so that Cugnot’s vehicle could be tested in secrecy and on uneven land. These tests did not take place as the letter was never answered. It is thought the vehicle was used in the grounds of the Arsenal where it had been built. It survived the Revolution and today is in the National Academy of Arts and Métiers, France where it has been since 1800. Louis XV gave Cugnot an annual pension of 600 francs which ceased after 1789. Cugnot became poor and was exiled to Brussels and was again pensioned by Napoleon little before his death in 1804. Napoleon was not interested in steam powered gun vehicles and so gave it little thought. In the following thirty years no inventors worked in France and Steam Power was developed further in the UK by names like William Murdock, James Watt and Richard Trevithick.